Western blot analysis of whole cell lysates probed with SLP-76 antibody followed by detection with Goat anti Rabbit HRP conjugated (1/10,000, STAR208P) and visualized on the ChemiDoc MP with 13 second exposure. Arrow points to SLP-76 (molecular weight 76 kDa). SLP-76 antibody recognizes SLP-76, also known as lymphocyte cytosolic protein 2, LCP2, 76 kDa tyrosine phosphoprotein, SH2 domain-containing leukocyte protein of 76 kDa or SLP-76 tyrosine phosphoprotein. Rabbit anti Human SLP-76 antibody recognizes SLP-76, also known as lymphocyte cytosolic protein 2, 76 kDa tyrosine phosphoprotein, SH2 domain-containing leukocyte protein of 76 kDa or SLP-76 tyrosine phosphoprotein. SLP-76 was originally identified as a substrate of the ZAP-70 protein tyrosine kinase following T cell receptor (TCR) ligation in the leukemic T cell line Jurkat. The SLP-76 locus has been localized to human chromosome 5q33 and the gene structure has been partially characterized in mice. The human and murine cDNAs both encode 533 amino acid proteins that are 72% identical and comprised of three modular domains. The NH2-terminus contains an acidic region that includes a PEST domain and several tyrosine residues which are phosphorylated following TCR ligation. SLP-76 also contains a central proline-rich domain and a COOH-terminal SH2 domain. A number of additional proteins have been identified that associate with SLP-76 both constitutively and inducibly following receptor ligation, supporting the notion that SLP-76 functions as an adaptor or scaffold protein. Studies using SLP-76 deficient T cell lines or mice have provided strong evidence that SLP-76 plays a positive role in promoting T cell development and activation as well as mast cell and platelet function (provided by RefSeq, Jul 2008). 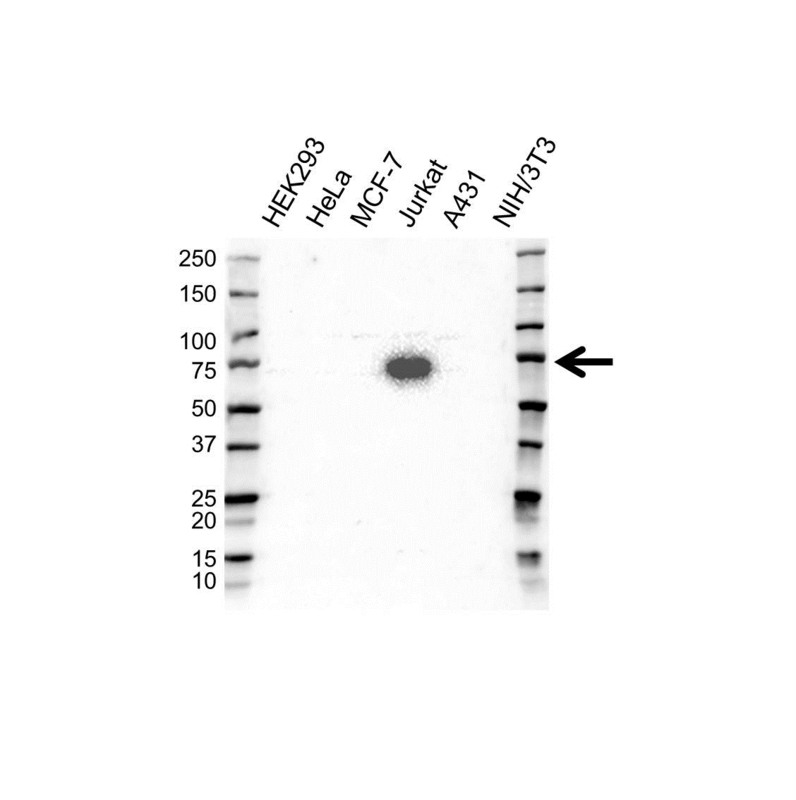 Rabbit anti Human SLP-76 antibody detects a band of 76 kDa. The antibody has been extensively validated for western blotting using whole cell lysates.